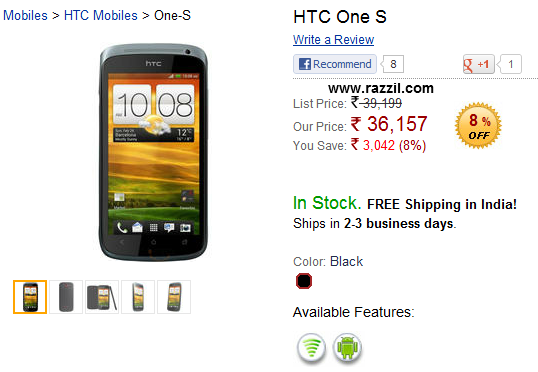 The Online store Infibeam has listed the HTC One S and the phone is available for whopping & unexpected price of Rs. 36,167 which is equal to its big brother HTC One X. HTC One S has released with 1.7 GHz dual core snapdragon S3 processor but in other market its available with Snapdragon S4 processor. Picture is not clear with Infibeam listing as they mentioned the 1.5 GHz core processor which is Snapdragon S4 processor. I recommend you to contact Infibeam about the issue. It has 4.3-inch qHD Super AMOLED display, 1GB of RAM, 32 GB of Internal Memory and 8 MP rear camera with an f/2.0 lens, 1080p HD video recording. The phone runs on Android 4.0 Ice Cream Sandwich with HTC Sense 4.0 UI. The phone has battery capacity of 1650 mAh. The only difference in HTC One X and HTC One S are screen size and the processor. Those who are waiting for this phone, I recommend you to wait for the official release.